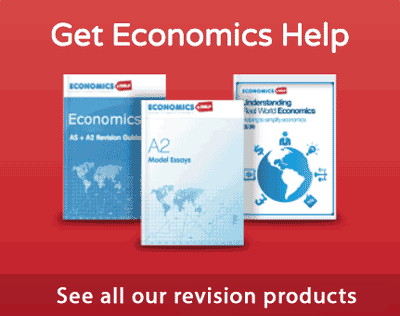 Home > Economics help blog > concepts > How to know when you’re in a recession? How to know when you’re in a recession? A recession is defined as a decline in real GDP for two consecutive quarters. An economy is in an official recession after six months of falling national income. 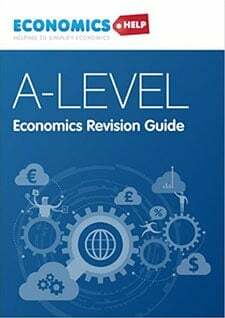 A recession will typically lead to higher unemployment, a decline in confidence, falling house prices, decline in investment and lower inflation. However, although that may seem quite straightforward, in practise it can be difficult to know. 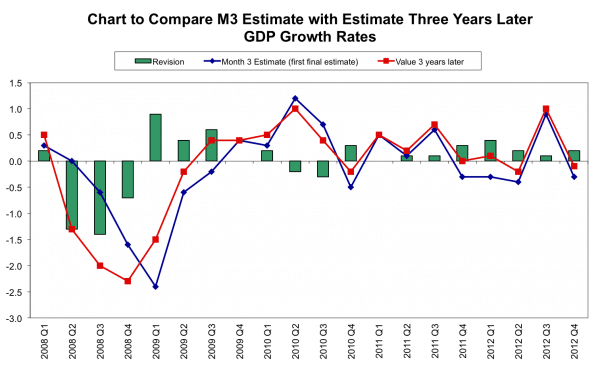 GDP stats may not tell us until a significant time lag after the event. The ability to know whether you’re in a recession is important for policymakers. As soon as you know a recession is occurring or likely to occur, the Central Bank can cut interest rates, and the government may wish to pursue expansionary fiscal policy. 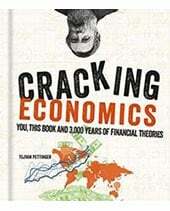 The sooner you know the better because monetary and fiscal policy can itself have a time lag. The most important statistic is real GDP. This shows that in Q2 2008, the UK had negative economic growth. 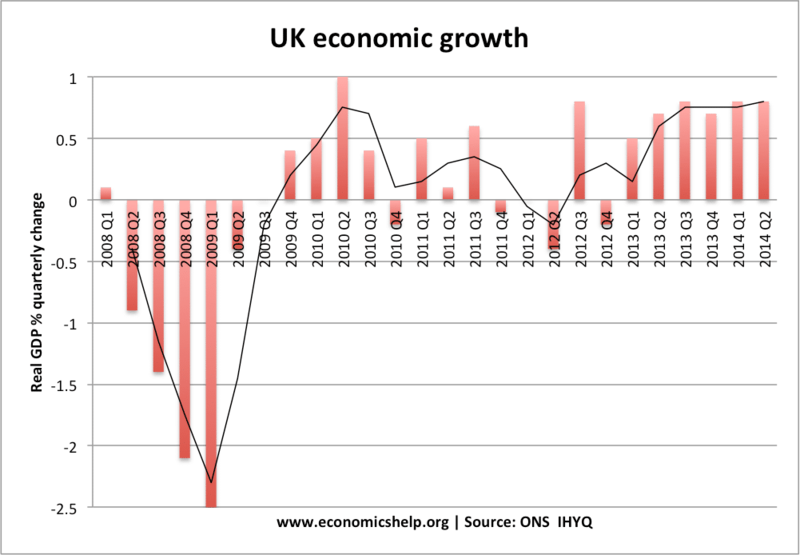 By Q3 2008, the UK is ‘officially’ in recession, because it is the second quarter of negative economic growth. The first factor is that there is a delay of a few months before publishing GDP stats. Stats for Q1 (Jan to March) are published April 27 – nearly two months later. The second factor is that initial GDP statistics are estimates based on incomplete information. They are revised later when the picture becomes clearer (more firms send in data). 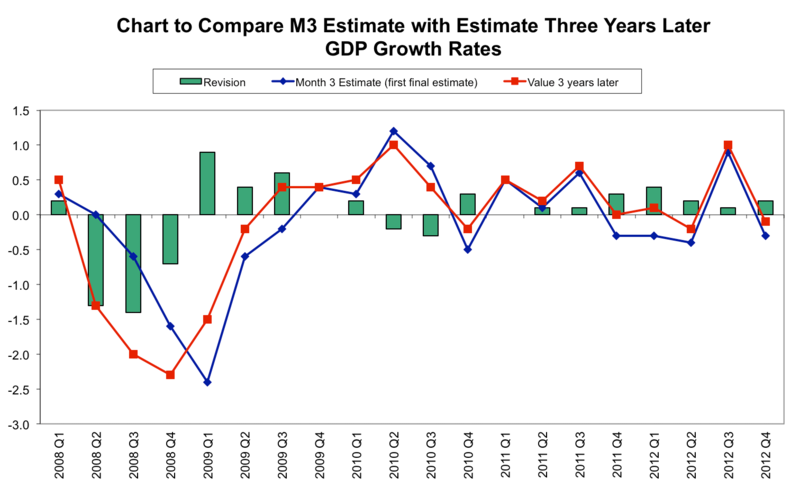 The initial estimates often miss any radical change in the trend. Initial estimates of GDP in 2008, were later revised down quite significantly. The First month estimates for economic growth in Q2 2008 was 0.2%. Yet three years later, this positive growth has been downgraded to -0.6 – a serious downturn. In other words, when Q2 2008 statistics came out – two months after the end of June, it appeared the economy was still growing. But, actually, the economy was already in recession. This is a limitation of relying on real GDP statistics. But, if real GDP statistics give a delayed picture, how else can we know? Consumer confidence is an indicator of whether people are optimistic or pessimistic about the economic future. This is often a reflection of the economic situation. If consumers see people being made unemployed, or if it is difficult to get bank loans or house prices falling, they will have negative confidence. In this situation, they will spend less – leading to lower aggregate demand and this will tend to cause negative economic growth. This shows that from Sept 2007, we have a decline in consumer confidence. 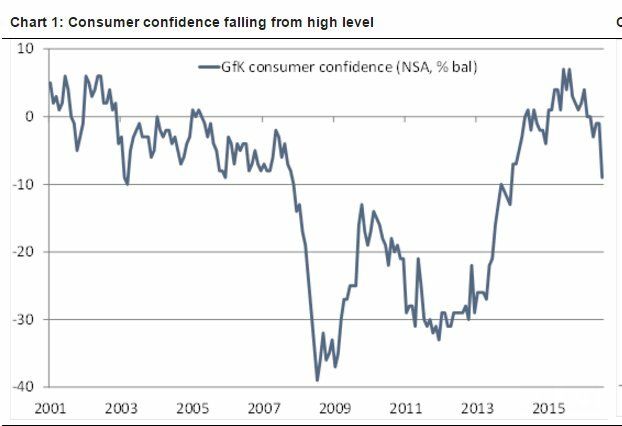 At the start of 2008, this decline in confidence becomes very marked, with record low levels of consumer confidence. This proved to be a strong leading indicator of the economy. When you get a collapse in confidence levels like this – it is highly likely that it will precipitate a recession. Confidence fell because of the financial turmoil, e.g. banks running out of money. Consumers understandably become risk-averse and increased savings and cut back on spending. Similar to consumer confidence is business confidence. If business is affected by financial uncertainty, they will cut back on borrowing and investment. 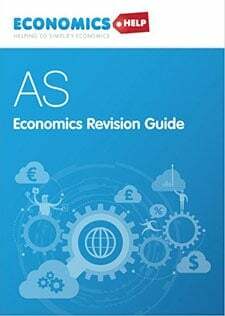 This has a direct effect in reducing economic activity. The Bank of England’s response to the decline in consumer confidence was delayed by a year. This is a combined measure of business and consumer confidence produced by the OECD. A fall in consumer confidence is not evidence of itself we are in recession. It is possible that consumer confidence could drop due to political factors, which prove temporary and don’t change the underlying economic fundamentals of an economy. For example, after 9/11, there was a drop in consumer confidence, but this didn’t precipitate a lasting economic recession. 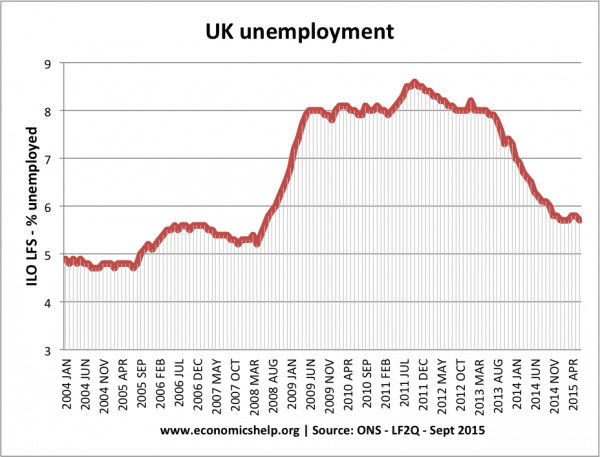 In the UK’s case, unemployment starts to rise from mid-2008. A sign the economy was turning into a recession. In a recession, we will get a rise in unemployment. However, unemployment is often a lagging indicator. Firms try to delay firing workers – to see if they can survive downturn without costs of firing and then having to rehire workers. A quicker indicator of an economic downturn may be a fall in average hours worked. This is one-way firms may try to cut costs without actually getting rid of workers. A fall in long-term bond yields can be an indicator that investors expect lower growth, lower returns and lower interest rates in the future. The rise in negative bond yields in 2016, is an indication of lower global growth expectations. However, bond yields are also affected by other factors, such as availability of investment options and perceptions of investment security. It is not a fool-proof method of saying you are in recession. Sometimes, we can technically have economic growth, but people feel they are in a recession – because they are becoming worse off. 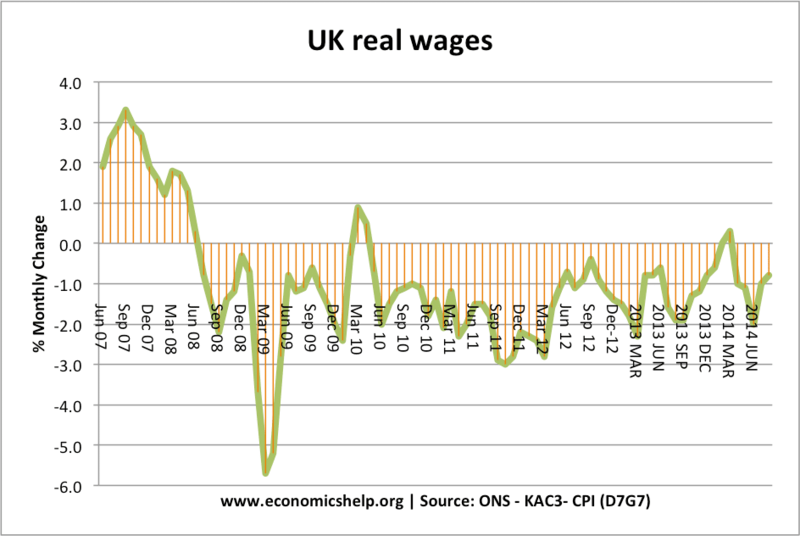 In 2012/13 we technically avoided recession, but average wages were falling. Some may feel this counts as a form of recession – because average workers are seeing a decline in average incomes. 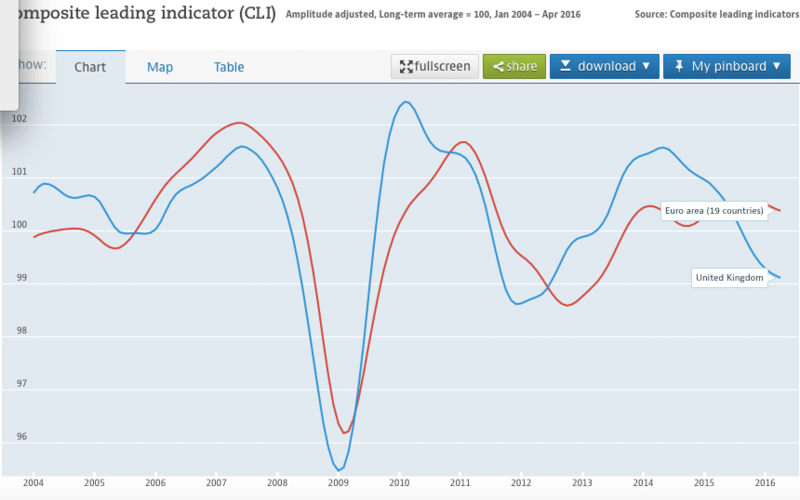 negative house prices mirroring periods of recession. 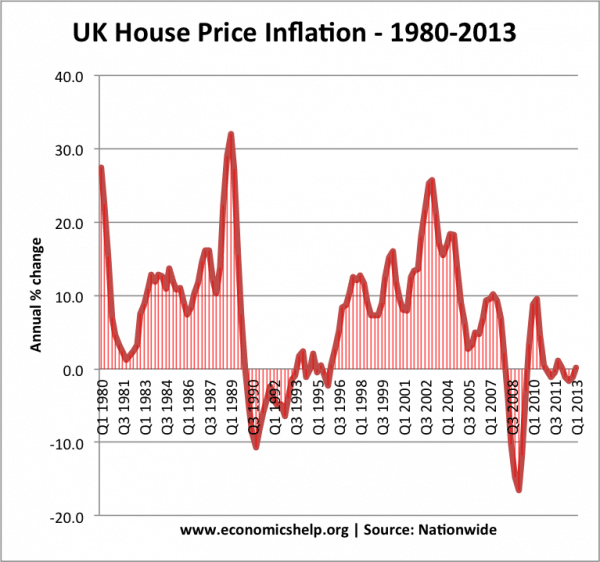 UK house prices are sensitive to economic changes. 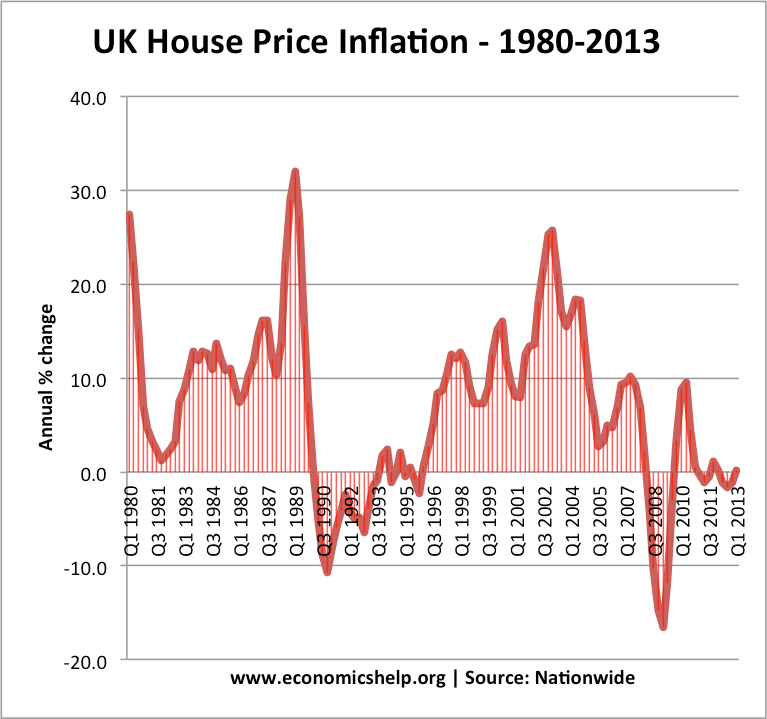 In an economic downturn, the UK’s volatile housing market tends to see falling prices. Even the uncertainty of Brexit was enough for people to start making lower offers for houses. Falling house prices are indication of economic sentiment but also can influence the economy. Falling house prices causes a negative wealth effect and fall in consumer spending. How to know if we’re in a recession? One factor alone, may not be enough, but when you start having more than a couple it is a strong sign of recession. 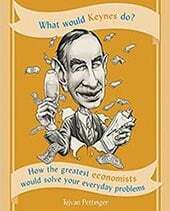 Can you talk yourself into recession?